Delicious and hearty pancakes – one of the favorite delicacies in Russia. They delight lovers of good food not just for pancake day, but also throughout the year. Fluffy pancakes can be the main dish for Breakfast or dinner. - 2 teaspoons of baking powder. Butter, melt on low heat. Connect the sifted flour with the baking powder. Then mix in a blender eggs, milk, flour with baking powder and about 30 g of melted butter into a homogeneous mass. Put the mixture into a small bowl and refrigerate for an hour, but preferably overnight. Before use, mix again, whisk thoroughly. Place a non-stick pan on a medium heat, brush with melted butter, put a tablespoon about 60 grams of the dough and spread it on the pan, layer about half a centimeter. Bake the pancake for a minute or until, until top sets and the bottom are brown. Then lift the pancake with a spatula, turn and bake the other side for 30-50 seconds. Then put on parchment paper. Bake all the pancakes, every time greasing the pan with melted butter. 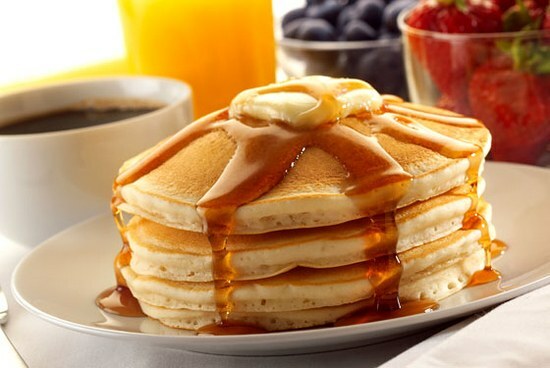 To the table serve the pancakes with honey, sour cream, syrup or jam. Butter pre-melt and cool to room temperature. Carefully separate the yolks from the whites and combine the yolks with the melted butter and sugar. Whisk all with a mixer until smooth and stir in baking powder mixed with flour. Mix well and add yogurt (if desired, it can be replaced with yogurt). To avoid lumps, introduce the yogurt gradually, in small portions, stirring all thoroughly. Chilled whites beat with a mixer together with salt in a thick lush foam and connect with the main mass. You should get a fairly thick batter. Heat a pan on medium heat, brush with vegetable or melted butter, then place 2-3 tablespoons of cooked dough, spread it on the pan with a layer of about ½ inch and bake the damn first one side and then flip and brown on the other. If pancakes are prepared from dough, then after it will work, more the dough is mixed. Otherwise the pancakes will lose their fluffiness. Proteins are recommended to beat in a completely dry glass or copper bowl. The aluminum pan fibers darken and the enamel can fight off the enamel, so such dishes should be avoided. Whites whipped well if they are fresh and chilled. Beat them in a cool place, it yolks pounded with sugar in a warm place.